SilentFX Noise-Reducing Gypsum Board is specifically designed to reduce airborne sound transmission between two adjoining spaces when used in wall or floor/ceiling assemblies. SilentFX features a viscoelastic polymer that dampens sound energy. 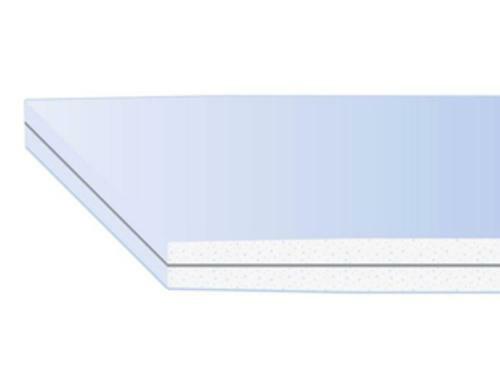 Application of the viscoelastic polymer between two specially formulated dense gypsum cores results in a combination that significantly improves sound attenuation and is ideal for systems requiring high STC performance. Commercial acoustic systems featuring SilentFX provide STC ratings of 50 and up. SilentFX is ideal for reducing noise in schools, hospitals, multi-family, hospitality, and residential projects. SilentFX® also features M2Tech® technology, which contributes to indoor air quality by providing enhanced moisture and mold resistance.